With her knack for being in trouble’s way, Sookie witnesses the firebombing of Merlotte’s, the bar where she works. Since Sam Merlotte is now known to be two-natured, suspicion falls immediately on the anti-shifters in the area. But Sookie suspects otherwise and she and Sam work together to uncover the culprit – and the twisted motive for the attack. This is the series that introduced me to paranormal romance, and for a long time I just rattled it off as my favorite both for sentiment and habit. However, I’m starting to lose some steam….well, I started losing steam several books ago actually, but here I am reading the book as soon as it was released just the same! See? Habit. Sentiment. It is my understanding that there might only be a couple books left – I hope that is the case. If Harris gets a new contract for this series I will start yanking on my hair. As much as I don’t want to give the characters up, it is time. Nonetheless, even though there are tons of loose ends and questions, a couple of big plot lines were satisfied/closed and the book was incredibly fast paced. I also found it a lot funnier then I remember the other books being. Also – there was a brief paragraph talking about the Queen of Oklahoma and Oklahoma in general and it referred to Eric as being a Sooner fan, and I had a nice brief fantasy of Eric and I wearing matching OU tshirts. ha. As for Sookie and Eric, that loose end is gonna blow in the wind, mocking us, until the flippin’ last page of the final book. I just know it. I really like Eric a lot, but all is not well in relationshipville. If nothing else, there will most likely be at least some major developments along those lines (whether for good or ill) in the next book. As long as Sookie doesn’t end up dating Bill again I won’t throw the books out the window. Anyway, the book fit in well with the series and I don’t have any major complaints! Hopefully the next couple of books will be the last and poor Sookie can finally catch a break. Now it’s time to wait another year for the next release…. You managed to express my sentiments very accurately in this review of yours. I quite enjoyed Sookie series but after a while I really got impatient by constant prolonging the closure of the most interesting storylines. 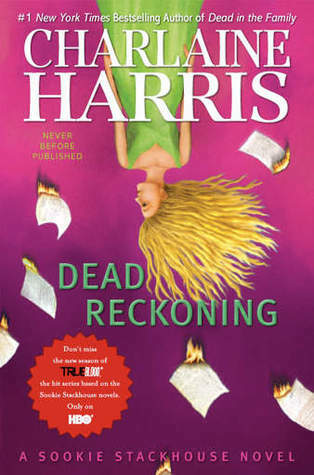 What's more I get a nagging suspicion that Charlaine wants to kill Eric off and I disagree with it. I am also not so very happy that Sookie is not going to turn into a vampire. If she hooks up with Bill again it will be a major bleh moment for me. I've heard that Ms Harris intends to write two more books but I am not sure I will read even this one. Ok, maybe after a while, when it is available in my library. Here Here! I thought I was the only one feeling let down after the last few books. The series needs an ending. As for Eric, Harris has been beafing this guy up since book 1. Bringing any logical thinking to dislike the others (Bill, Quin, etc.) If she takes Eric away from Sookie I don't believe I'll continue to read on. And I know "its been done before" but what is wrong with allowing Sookie to give in and be with the man she loves forever? Instead of growing old and being alone. Its what needs to happen and I hope Harris will come to her sences and stop listening to all the comments on, "do something different." Some people need to think before they speak! Its what needs to happen and I hope Harris will come to her sences and stop listening to all the comments on, "do something different." Some people need to think before they speak! My thoughts exactly. By the way, different not always means good. I haven't read any of the books in the Sookie Stackhouse series, since I watched the series and didn't enjoy it all that much, but I might have to give it a try some time. I haven't read this far into the series, but I know what you mean about series loosing the appeal. I feel the same happened with the House of Night series. Brilliant review, and new follower. I'm sort of invested in Eric now. Oh Well.